When determining how efficiently earthing electrodes discharge electrons into the earth and important concept is the “sphere of influence”. 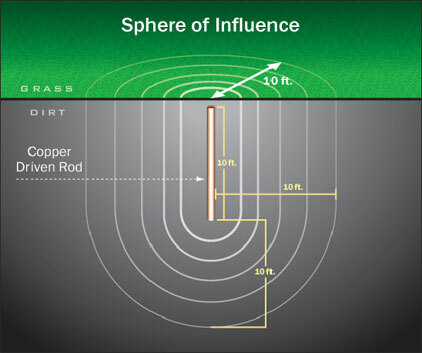 The sphere of influence is the volume of soil throughout which the electrical potential rises to more than a small percentage of the earth potential rise of the earth electrode, when that electrode discharges current into the soil. 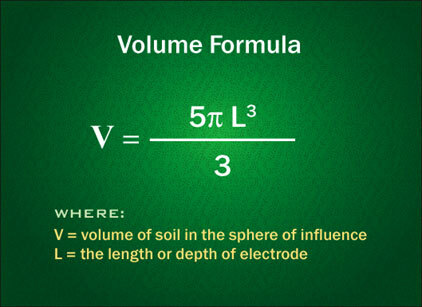 The greater the volume, compared with the volume of the electrode, the more efficient the electrode. Long electrodes, such as earthing rods, are the most efficient. The surface area of the electrode determines the ampacity of the device, but does not affect “the sphere of influence”. The greater the surface area, the greater the contact with the soil and the more electrical energy that can be discharged per unit of time.